That's right. What you see here, is indeed a Ford F-150 plugged into an electric outlet. This would have seemed like Science Fiction just a few years ago. 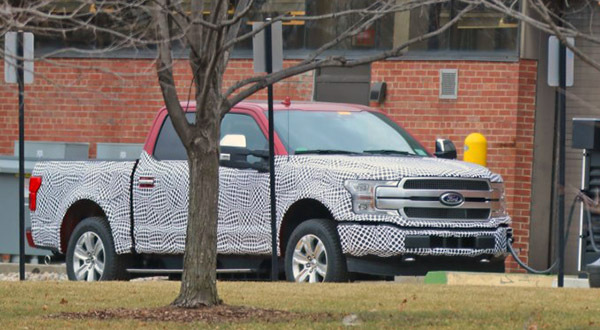 But Ford has already announced there will be an EV version of the next generation F-150. This is basically terrible news for Tesla. Which is supposed to unveil their electric pick-up truck later this year. Sure, the Tesla will probably look pretty futuristic next to the F-150. But it seems that most truck buyers don't really care. They like their trucks old fashion and square. As Ford sold over 900 000 of them last year! 900 000!!! I am sure there is actually a market for something more modern looking. But it must be pretty small. Terrible news for Rivian too. If they can give it at least 350 miles with solid construction, this will be big for Ford. If they could do the same to the Explorer and Edge, it would be HUGE. Superb camouflage. I’d never have known it was a Ford. How is this terrible news for Tesla? Ford has already shown that they are not committed to EV's. They will dabble with electrification, give their existing F150 maybe 30 EV miles of range, but continue to support the oil industry. This will be a compliance car. Nothing more. Tesla's pickup will make this thing feel like a lawn tractor.